Recently, I had the honor and privilege of conducting an email interview with accomplished children’s author, Lisa Moser. She is the author of Monster in My Backpack, Perfect Soup, Watermelon Wishes, Squirrel’s World, Kisses on the Wind and Railroad Hank. She is also a fellow Christian. Her books have a wonderful way of engaging and connecting with children and I highly recommend her work. 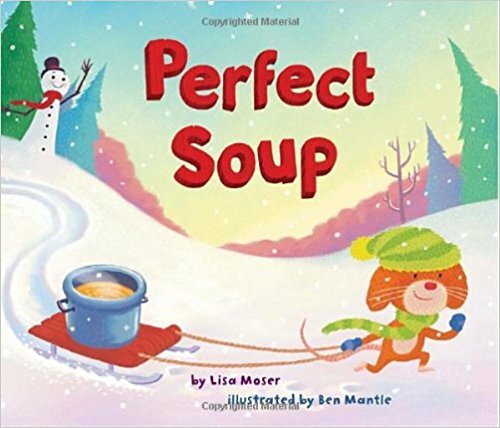 I particularly think that Perfect Soup would be a “perfect” addition under this year’s Christmas tree! Thank you, Lisa, for being willing to participate in this email interview. I am excited to offer CfP readers the chance to get to know you and your work in children’s literature. I am intrigued by the diversity in your writing. All of your books seem to have a distinct flavor and appeal. Where do you get the inspiration for your books? And specifically, what was the inspiration behind your newest book, Railroad Hank and its many colorful characters? I approached Railroad Hank in a very different way. Basically, I wanted to write a train book. I’ve always loved trains and have seen some really fabulous train models. In fact, when my daughter was little, we played with her train set all the time.I got the idea for my book Squirrel’s World by daydreaming out the window. I watched this very energetic squirrel and this very timid rabbit. The squirrel was all movement- up and down trees, leaping, jumping, running, but the rabbit never moved. There were the characters for a book, right in front of my eyes. I wrestled with this train story for several years, though. At one time, I had a mouse that loved to drive a toy train with peppermint candy wheels. Then I played with the idea of a train that went around and got all of this crazy cargo for a king. But when I stumbled upon the character of Railroad Hank, everything fell into place. He was the key to the whole story. Once I had Railroad Hank on board, writing the story was easy. With the winter months approaching, I can think of nothing better than to snuggle up with a cup of cocoa and your book, Perfect Soup. I love this tender story and found many elements of biblical principles throughout its pages. How has your faith in God influenced your writing as a children’s author? Please help and bless me when I write so that these stories will always bring goodness to children. I ask this in Jesus’ name. Amen. God has blessed so many parts of my life, and I want the work I do to reflect God’s great love, goodness, mercy, and gentleness. 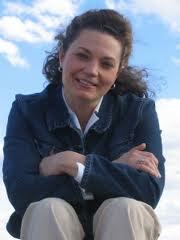 So, I depend on prayer to see me through all the aspects of my work through writing books. I have really felt God and His blessings along this whole journey, and I am so thankful to Him. What is the greatest joy you get from being a children’s author? You know, I love so many aspects of being a children’s author, but my favorite part is the writing. It’s challenging and creative, and I get so excited when at long last the pieces of a story finally start coming together. For a short time, I get to be a child again, lost in the world of story. You obviously have a passion and a gift for writing in a way that reaches and touches children. Was that gift supported and nurtured when you were a child? What would you say to parents who notice an emerging gift or talent in their children? Absolutely. My parents were great supporters of my reading and writing when I was a child. My mom read to me all the time when I was little, and my dad and I remain the avid readers of the family. But it was my Grandma Crockett that showed me how to be a writer. She would write stories about my little sister and me. Then she’d draw the pictures, bind everything up with bright yarn, and mail it to us. That was when I was first inspired to become a children’s writer. I stand in awe of the great gifts God gives to each of His children. I’d encourage parents to share in the joy of these gifts. If the child is a writer, it’s fun to put their story in a special folder or to sew it up into a book. My daughter’s stories are on the bookshelves right next to my books. Celebrate a new story by reading it together as a family. If the child has a talent for art, it’s great to frame their pictures and display them. If the child’s talent is sports, practicing with them outside is a wonderful way to connect. Children’s gifts are so many and so varied. God blesses each of us in such a unique way! Sharing God’s gifts with others and honoring God through those gifts is a privilege and a blessing. A while back, I wrote an article on how parents can use story time to instill and solidify values in their young children. Do you have any insight or wisdom on how parents can use children’s books such as yours as more than just a colorful diversion? Oh, I loved reading to my daughter so much. It was such a quiet, lovely, wonderful time together, and I will always treasure it. For me, it was a time to laugh together, cry together, wonder together, marvel together, be together. It was just a very natural time to slow down, read, talk, and enjoy life. Do you have any books that you are working on now? If so, could we get a sneak preview? Right now, I am rewriting a story in a different way. I find that happens often when I take a break from a story. When I distance myself from a story for several months, suddenly I can see the holes and the problems in it. So, I’m re-envisioning the story, and it’s changing in some really fun ways.I’m actually terrible at telling my stories out loud before they are written. They always come out very flat and uninteresting, ironically. I depend on days, weeks, and months of putting words together in just the right order to make a good story. But I can tell you it involves two friends who have an argument and then find their way back to the friendship. Thank you, so very much, for this interview. I truly appreciate the opportunity to share. God bless! Thank you. It has been a real honor. I look forward to reading many more books to come!